Nothing can put an early damper on a vacation quite like realizing your electronics just aren’t going to fit into international electrical outlets, no matter how hard you try to jam them in. (We advise against this method; fate has been cruel to you, yes, but spare your gadgets.) Instead, turn to Satechi, which has unveiled its new Smart Travel Router & Adapter just for situations like this. Though Satechi’s Smart Travel Router & Adapter is bulkier than it needs to be—and flimsier than we would have liked—frequent travelers will clear space in their suitcases for its unique dual functionality. 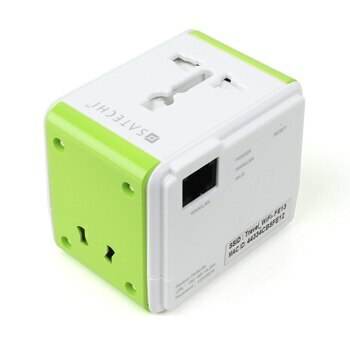 Beyond fitting the electrical outlets of more than 150 countries with the push of a button, this clever cube also offers a USB port to charge a second device, and four networking modes for all of your wireless Internet needs, including private connections for enhanced security and mobility. Available for purchase online, the Smart Travel Router & Adapter is the sort of tool that might be just as useful for travel as your passport. For more information, visit Satechi‘s official website. The converter (router) comes in really handy with the hot spot function – a real time saver.